Iron Chef and I celebrated our anniversary last week in our typical fashion — we headed out to hunt for mushrooms. 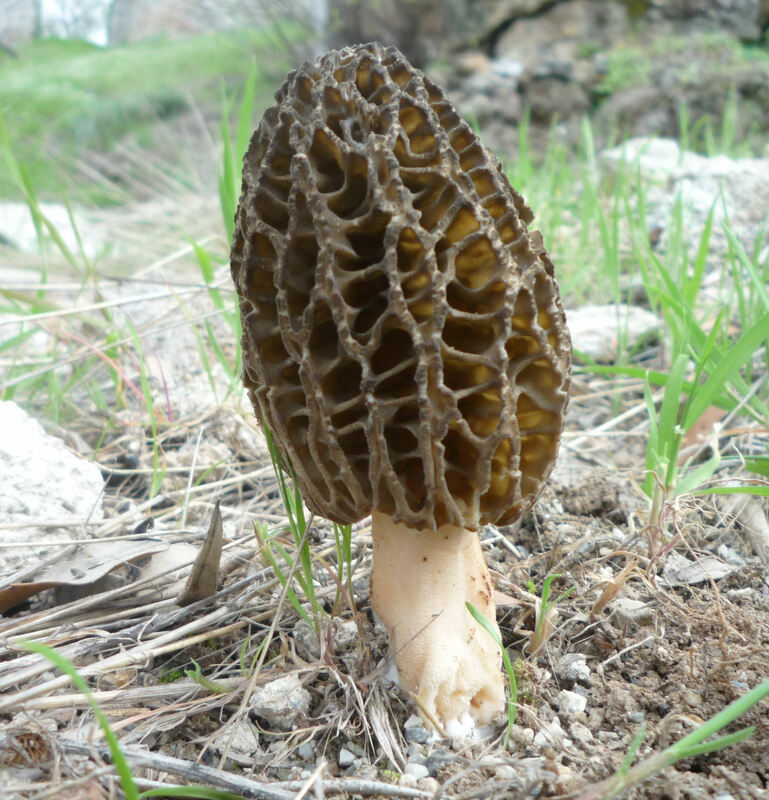 Morels or oysters, we didn’t care; it’s just nice to go home and saute the bounty and sip a little vino fino. The outing was lovely, the wildflowers around Podunk spectacular — but we found nary a shroom. I’m not a greedy girl — I didn’t need a truckload — but zero mushrooms? That seemed sad. So I harkened back to an unusual soup a foraging friend introduced us to last spring. The delicious and healthful concoction was centered on the ingredient of stinging nettle. 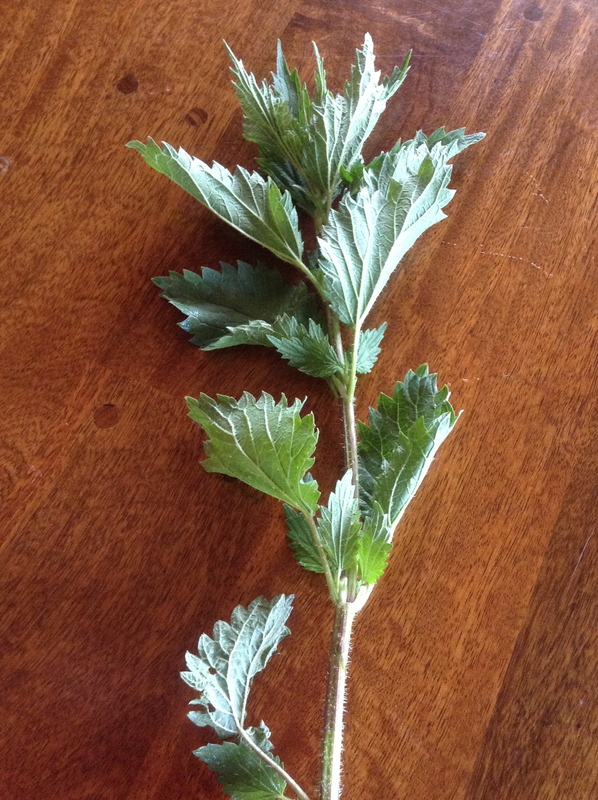 The mushrooms may have eluded us, but certainly we could find stinging nettle! I made the suggestion to Chef. He pointed out that we didn’t have gloves, which might prove to be a problem, but then wondered aloud if perhaps the tender young stinging nettle shoots had not yet developed their pricklies. I quickly tested this theory on a handsome patch, carefully grabbing the stem. Wrong. My hand felt like fireants were crawling over it. Determined not to fail, I made mittens out of 2 ziplock bags that formerly housed salami and cheese. I gathered a pleasing bundle of the nettles with only minor inflammatory peril. Back at home, Chef was busy working his magic. To the best of my knowledge I have not tested this assumption, but sometimes I believe the Iron Chef could make a dog turd taste fine. As he cooked and blended, Her Royal Highness came home and spotted the greenery in the sink. “What’s that?” We explained our project. “Didn’t you get stung?” HRH inquired. I confessed that I had quite a few times, in hopes that she would understand how special our forthcoming meal would be. Her brother, the Odd Number, heard the exchange and saw a chance to shine. “I’ll try some,” he said, bravely. The soup was vibrant green — an exact reflection of spring. My mouth watered at the same time my satisfaction of being so freaking self-sufficient blossomed. We tasted it. Hmmm. Perhaps an acquired taste. I couldn’t quite remember the delicious nettle soup we’d had last spring tasting like this at the onset, but then again, that was a year ago. Her Highness ate a yogurt and eyed the three of us with amusement. Which caused Odd to spoon more of the soup into his mouth. “It kind of tastes like fish,” Odd declared. Iron Chef and I nodded in agreement, tasting a tiny bit more to see if we could expound on the flavor. We pushed our bowls away and chased HRH around the house with stalks of the remaining stinging nettle.